I’ve already shared how much I love animal prints – but this outfit was really created out of a frustration with my current closet, and the same old same old weather. Starting with a simple sheath dress, try adding a button down shirt- either tied at the waist like I did, or open and loose for a more relaxed look. 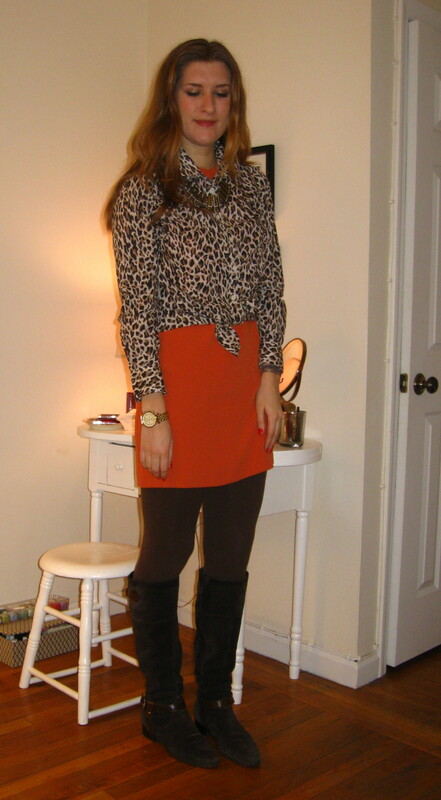 I went with a statement necklace and a classic pair of brown boots. You could also pair this look with heeled booties, and more jewelry for an off-duty weekend look. good job grace! I am at the same place of frustration with this winter weather! I am coping with your suggestion of mixing spring colors- staying grounded in winter neutrals. It’s working I think!